In the aftermath of the 2013 Boston Marathon Bombing, Chicago received national attention for its comprehensive network of surveillance cameras. One of the first U.S. cities to make extensive use of surveillance cameras, beginning in June 2003, the Chicago Police had launched “Operation Disruption,” a multi-phased plan to install “blue-light” Police Observation Device cameras (PODs) in high crime areas. Able to rotate 360 degree and zoom to a fine level of detail, bullet proof, operable in any weather condition, these cameras record continuously and switch into night vision mode after dark. They are used to monitor street crimes and direct police deployment. In 2006, “Operation Disruption” gave way to “Operation Virtual Shield,” a scheme to create the most extensive and integrated video surveillance network in the United States. In January 2007, the city began installing cameras at least 20 high schools. Under Mayor Rahm Emanuel, the city has added 500 more and now has an integrated system of 22,000 cameras citywide (see map). This system includes the “blue-light” street cameras as well as cameras on CTA trains, buses, and public transit stations and cameras installed on public buildings such as schools and Chicago Housing Authority facilities. 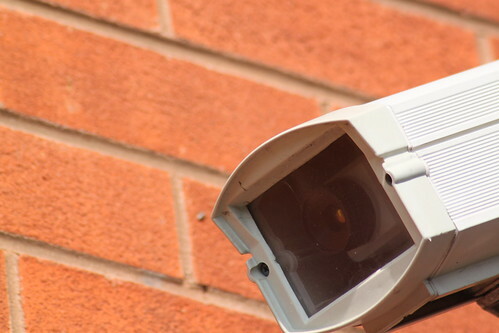 As part of “Operation Virtual Shield,” the city upgraded cameras to incorporate facial recognition and “automatic tracking” or the ability to follow a person or vehicle from one camera to the next. Today, the data from these cameras is wirelessly transmitted to the Chicago Crime Prevention Center (CPIC) which also can individually control any camera (Chicago Police Department 2013a; 2013b). CPIC is one of 78 fusion centers recognized and partially funded by the Department of Homeland Security. With a potentially limitless “all crimes, all threats, all hazards” mission, the CPIC operates 24 hours a day from the fourth floor of police headquarters at 3510 S Michigan Ave. It has a regular staff of 30 to 35 people. Personnel from FBI, DHS, and Illinois State Police are assigned full time to the CPIC, while personnel from other agencies including the Illinois Department of Corrections, Cook County Sheriff’s Police, State Department, Metra Police, DHS Customs and Border Protection, U.S. Secret Service, U.S. Attorney’s Northern District of Indiana, Transportation and Security Administration and various suburban police departments also deploy the CPIC as needed (Chicago Police Department 2013b). The CPIC is an information clearinghouse and analytic center that analyzes long term trends, monitors the “threat environment” to achieve real time “situational awareness,” and provides tactical case support. In the latter capacity, the fusion center provides “real-time violent crime detection monitoring and response, continual assessment of available resources for the purpose of possible redeployment of manpower, instantaneous major incident notification, analysis and identification of retaliatory violence and automated construction of enforcement missions to thwart retaliatory violence, crime pattern identification, and immediate access to in-depth background data on persons of investigative interest” (Government Accountability Office 2007: 70). Fusion centers like the CPIC are associated with intelligence-led policing (ILP). ILP operates on two fronts. One the one hand, ILP is “a top-down management approach” that “uses crime intelligence to objectively direct police resources decisions” and offers a “business model and managerial philosophy where data analysis and crime intelligence are pivotal to an objective, decision-making framework that facilitate crime and problem reduction, disruption and prevention through both strategic management and effective enforcement strategies that target prolific and serious offenders.” On the other hand, ILP reorients policing around intelligence in an effort to shift the profession toward the pre-emptive disruption of crime. This future-oriented mode of policing entails the individual targeting of chronic offenders, using informants and surveillance to identify and track them (Ratcliffee 2008: 6, 83-87). In Chicago for example, analysts at the CPIC evaluate an individual’s parole or warrant status, weapons or drug arrests, arrest histories of the person’s acquaintances, and whether they have been the victim of a shooting to generate a “heat list” of individuals “500 times more likely than average to be involved in violence” (Gorner 2013; Flannery 2014). While fusion centers and ILP are considered by some to be the future of law enforcement, the centerpiece of the so-called “Homeland Security Era” of policing in the United States, they also raise a series of concerns related to civil liberties violations and political policing. In Chicago, the CPIC has recently been implicated in the illegal surveillance of activists associated with the Black Lives Matter protest. “Police scanner enthusiasts” found evidence that the Chicago Police were using StingRay devices—the brand name of a device made by Harris Corporation to simulate a cell tower’s radio signal and capture data from nearby mobile phones, tablets and similar wireless devices—to monitor the Ferguson solidarity protests. The intercepted communications revealed that this data was being sent to the CPIC (Handley 2014). Like all issues surrounding intelligence generally and fusion centers specifically, these allegations are obscured by official secrecy. The Chicago Police are currently being sued to release documents that would prove that the department owns a Stingray device (Smith 2014). Such secrecy may not last long. The lawsuit and ongoing protests around police abuses are developing into a broader effort to assert community control over the police. The Chicago Alliance Against Racist and Political Repression (undated) is organizing a drive to pass legislation that would create a Civilian Police Accountability Council with powers to appoint the police commissioner, rewrite the police rule book, investigate police shootings, and otherwise oversee the police department. A coalition of grassroots groups are planning a demonstration this August in support of the legislation and are already pushing alderman to support the legislation. Outside of Chicago, the proposal is attracting attention of other activists in other cities, including Baltimore and St. Louis, who are considering launching similar campaigns. Gorner, Jeremy. 2013. August 21. “Chicago Police Use ‘Heat List’ as Strategy to Prevent Violence,” Chicago Tribune, August 21. Ratcliffe, Jerry. 2008. Intelligence-led Policing. Portland: Wilan Publishing.